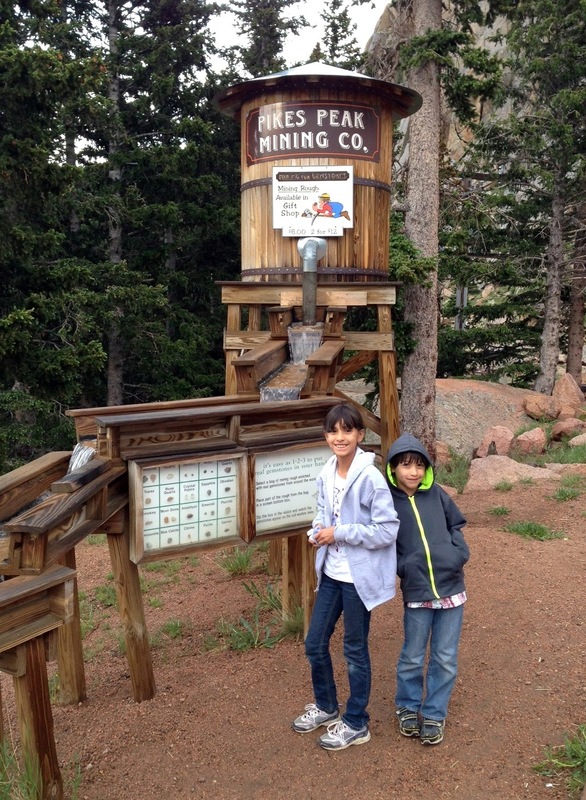 We've been discussing going up to the top of Pikes Peak for awhile now, and on the 4th of July, we decided to take the plunge! We packed up the kids, after making them change into jeans and jackets (fyi, smart move), got Dante on his harness so he could come too and headed out. 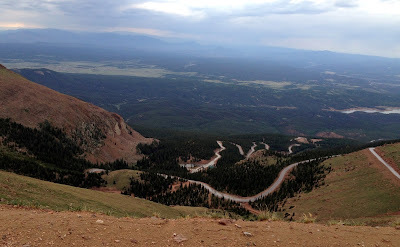 When we got to the gates to head up Pikes Peak Highway, the guard recommended we head straight to the top and make our stops on the way back, as it looked like a storm front was coming in. 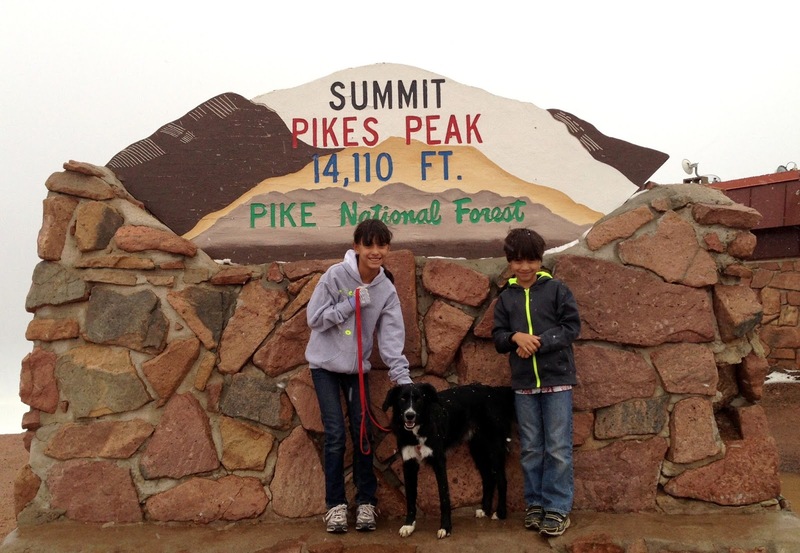 We heeded his advice, and went straight up to the top, which was definitely a good decision. As it was, there was snow, rain, and the most bizarre static ever ringing in our ears. The kids were great sports about it, once we warmed up a little in the shop up top. I did manage to get Ben and Dante to pose for a few pictures, but Faith was freezing and gave up. Bigfoot! Yes, really, Bigfoot. 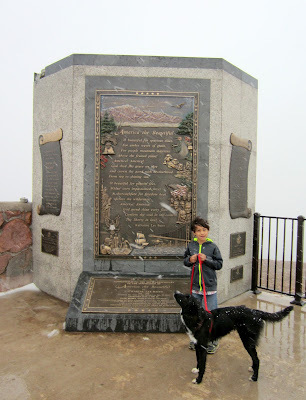 Apparently, the rumors are that Bigfoot may have been spotted at Pikes Peak, once upon a time. We were quite fascinated with the idea and both kids needed a picture with the Bigfoot statue. As my one friend and her son are also Bigfoot fans, we made sure to document the experience with plenty of photos to send her (I also once pulled over in middle of nowhere Oklahoma to take a picture of the Bigfoot BBQ for her). 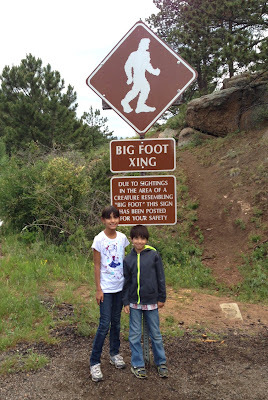 We also realized that there was a Bigfoot Crossing sign, which necessitated another exit the highway trip. 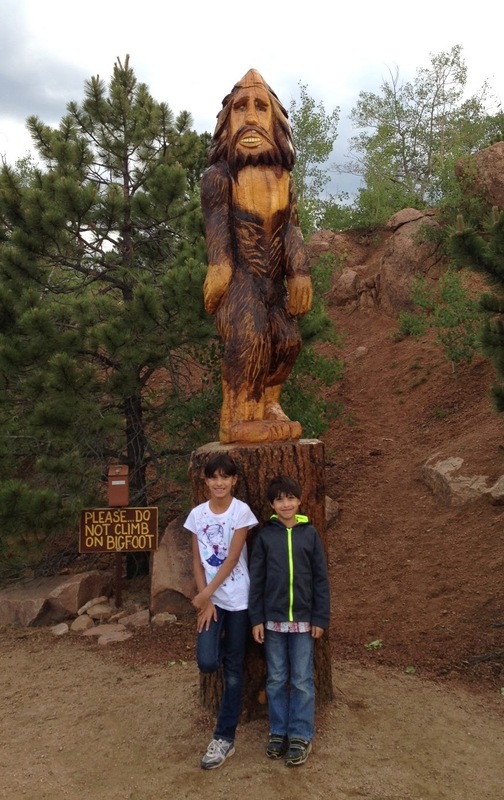 You never know when a Bigfoot might cross your path, so we wanted to be sure to get a picture of it too. The small stone slab on the right in the background? It's a Bigfoot footprint, which the kids measured their feet against. Neither of them are Bigfoot, yet. We loved the drive and the view. I think we'll do it one more time, on a day with clear weather. While we did get some pretty pictures, the view from the top was obscured by the clouds, so I think it will require a second trip!